Villa Amara on viihtyisä kivirakennus, jossa on 2 makuuhuoneen lomamökki, jossa on oma uima-allas ja upea näköala luontoon Kayaköyn maaseudulla. Tämä ihastuttava huvila on rakennettu perinteiseen tyyliin paikallisesta kivestä ja se yhdistyy täydellisesti luonnon kanssa. Villa Amara on todellinen luonne ja charmi, kun taas korkeiden kiviseinien sisällä ja tyylikkäissä kalusteissa, joissa on nykyaikaiset kalusteet, lisää nykypäivän kosketusta. Tilavat sisätilat tarjoavat valon tunteen kaikkialla, ja kunkin huoneen perspektiivi on suunniteltu tekemään suurimman osan lumoavista näkymistä. Perusteet ovat laajat, suurella terassilla ja upealla asella uima-altaalla, joka on täysin sijoitettu imbibe kauniita maisemia. Amara tarkoittaa paratiisia Villaa ympäröivät vanhat puut, jotka antavat lisää luonteen ja tarjoavat sävyjä niille, jotka haluavat paeta lämpöä. Voit vaeltaa kauniisiin puutarhoihin, pensaita, kukkia ja oliivipuita, ja rentoutua uima-altaalla ja terassilla lasillisen viinin tai hyvän kirjan avulla. autamme vieraitamme nauttimaan mukavasta lomasta huvilassamme. Saat tietoa ravintoloista, alueesta, aktiviteeteista ja ostospaikoista ect. 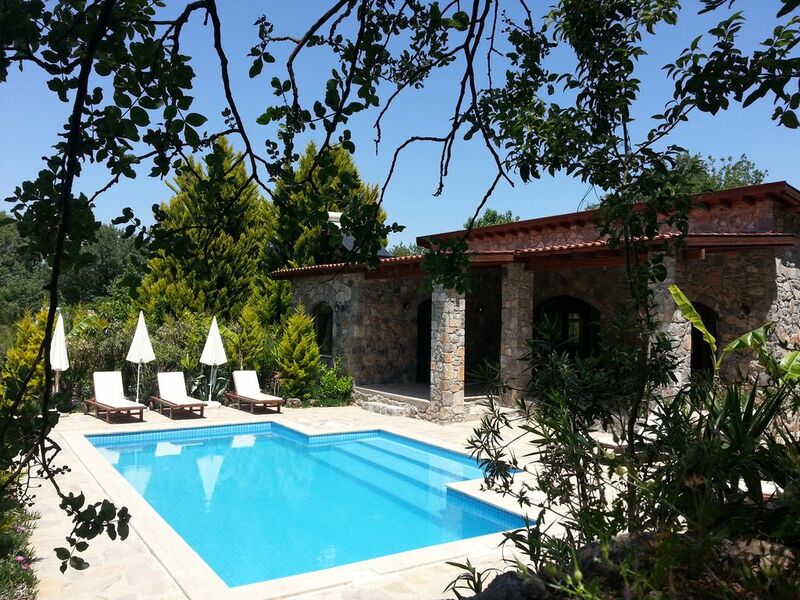 I was a bit tearful when we arrived, tired and in need of a rest, at this beautiful villa in Kayakoy, hard to believe we could stay in such a lovely, private property, with fabulous views for 10 days. Arife and Oliver were the perfect hosts, available if needed, but not intrusive. We had a lovely, very welcome, first meal brought to us by Arife, and Oliver was on hand to help when a thunderstorm knocked out the electricity in the village. They were also incredibly kind in sorting out a new spare tyre for us after we got a puncture. The villa was immaculately clean and well equipped. It's a little tricky to find initially, just have to believe Arife's instructions and hold your nerve through the narrow streets of the village. We enjoyed the village, it's restaurants and bakery, all walking distance. We walked through the ghost town and over the hill to Coldwater Bay a couple of times which was beautiful, drove out to Patara to take in some history, enjoyed the marina in Fethiye, and Gemiler beach was small but friendly. We didn't do too much really as we were happy to relax in the villa and by the pool, why would you need to go anywhere else? Superb villa, air con in bedrooms, wet room, large patio with swimming pool. Views toward the mountain. Rural retreat very quiet. Villa Amara is the perfect setting for a relaxing break away from all the hustle and bustle of the tourist crowds. The pool is beautiful, surrounded by fruit trees with wonderful views of the mountains and an abundance of nature on your doorstep. The villa is clean, nicely decorated and has everything you need. The owners, Arife and Oliver were wonderful hosts who helped us with everything we needed - including cooking us a delicious welcome meal (much needed after long journey and late night arrival) and arranging a private boat trip for us. We very much hope to return in the future. Rosie, Sal, Louis & Dylan. What a wonderful villa in a wonderful setting. It is a dream!!! We had the best holiday in villa Amara since we made holiday in Turkey. Arife and Oliver are so friendly and helpful, they are the best host we ever had. Thank you again and we will missing villa Amara , the amazing pool and the spectacular view into the nature. We will defeninitely come back next year. Could hardly have been better! We love the Edenvillas, each one feels isolated and there is a feeling of being the only guests there. Arife and Oliver are always available but never intrusive. We really enjoyed our extremely leisurely breakfast(9.30-14.00!) as Arife is a marvellous cook and host. We cannot wait to return next year. Any time spent there is never enough for us, it is highly recommended if you want a peaceful and quiet holiday. There are lots of good restaurants in Kayakoy and lots to do in the surrounding areas. We have been visiting the area for almost 20 years and have yet to be bored. thank you so much for your comming and staying in our lovely VILLA AMARA . Oliver and me are very happy to hear that you had a very good time in our holiday home and in Kayakoy. Thank you again and we can`t wait to seeing you again next year . On arrival to Kayakoy we were met by Oliver, who drove us up the dirt track to our secluded villa. Villa Amara is nestled with three other villas, in a quiet and secluded area, next to the ghost village. The villa was decorated beautifully and was complete with up to date kitchen appliances. Upon arrival Arife and Oliver showed us round the villa and Arife had cooked an amazing meal for our first night which she delivered to accompany the wine she had left in the fridge. The villa is in a beautiful spot, and although three other villas are there, it is quiet and relaxing. The pool is fantastic, big enough to have an inflatable chair, a lilo and a massive inflatable swan all in the pool with four of us at once. Although secluded our two teenage daughters adored it, especially the privacy around the pool area. We asked for a clothes airer to be supplied as I wanted to use the washing machine and when we returned home the evening one was waiting. There is a short walk to get into the village, for small convienience stores and an amazing bakery. It is also easy to walk to some fantastic local restaurants and the ghost village. The village is a stones throw from great beaches, especially our favourite, Kidrak. Also Hisonaru is easily visited where it is lively and bustling. We also went to Fethiye market for supplies of fantastic fruit and veg. Arife organised car hire for us, and we would recommend this to get the most it of the area. And she organised a private boat trip which we would recommend. Arife and Oliver go out of their way to ensure your holiday is perfect. This was a fantastic holiday in a beautiful area, a small piece of paradise. thank you so much for your coming and staying in our villa Amara. Oliver and me were very happy to hear that you had all a good time. For us it is very important to make the stay of our guests more than comfortable. We hope to have you back in the future as our guests in our place and holiday home villa Amara.